Wholesale TV Stand Company Sells Top Quality Mounts Online! These TV Racks Hold 20" TVs! Literature holder provides passersby with additional information. Optional wheels are lockable to keep stand stable. 100 x100 VESA plate can hold a 12" to 22" plasma or LCD TV. Tilting bracket gives more viewing options. 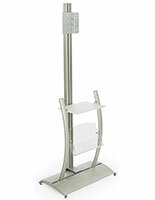 This television mount, also called LCD rack is ideal for smaller tradeshow displays and digital signage. 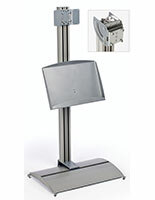 Plasma TV stands can mount a 17" monitor including brands such as LG, Sony, and Vizio. This television bracket, monitor mount is VESA compatible allowing majority of brands to be mounted to this easily transportable stand. Mounting a 17" flat screen to these Plasma TV stands make the unit ideal and mostly used at tradeshows, schools, corporate offices, transport locations, retail store, events and many other locations for displaying company information or instructional videos. This plasma mount, monitor rack will go with any LED that is 12" to 22" that weighs less than 30 lbs. These LCD TV stands are the best option for television display because it has additional shelving to store pamphlets and brochures about your company as well as wheels to transport from one location to another. 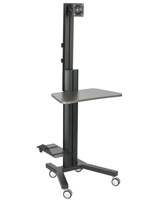 LCD stands are the perfect plasma TV stands for use in heavily trafficked areas. The brushed aluminum is quite durable, as well as being able to easily fit in with any environment. 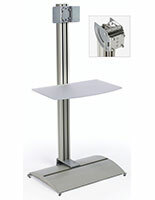 These LCD stands, plasma TV stands are sold with a tilting bracket. Passersby will be able to easily see the television if it's tilted down towards them. The LCD TV stands feature a wide base that offers a sturdy display with little worry of tipping. 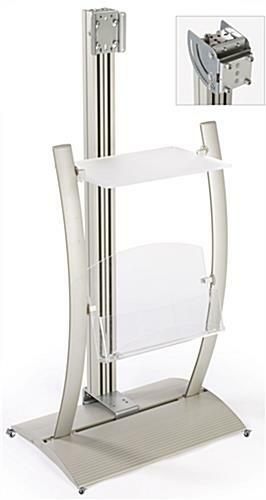 These plasma TV stands, also known as a screen stand or an LCD stand, combines a literature holder and shelf with a television stand into a great marketing tool, perfect for any business. 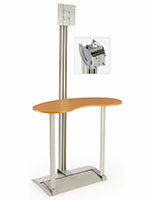 These plasma stands, LCD TV stands are a must have for retail stores, malls, and trade shows. The plasma TV stands include a VESA bracket to mount your 12" to 22" television, weighing less than 30 lbs. 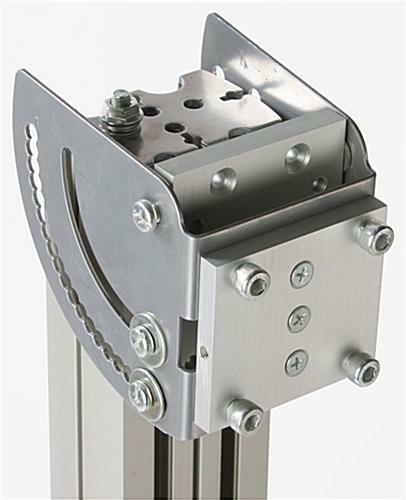 VESA brackets are standardized with manufacturers to ensure most flat screen televisions will work. Although we include all the necessary hardware to mount your television to the bracket, some televisions will require other screws that can be purchased at any local hardware store. 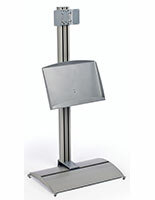 These LCD TV stands also have a literature holder to place brochures within to provide additional information. A shelf on the stand is perfect for holding a DVD player or additional promotional material. 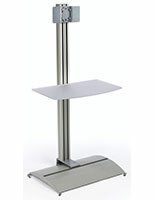 These plasma TV stands, like an LCD stand or a screen stand, feature a hollow pillar holding up the television. You can place wires through this pillar and hide them with (4) included plastic strips, helping to maintain a neat and tidy display.